Tons of workout apps are developed for our smartphones and finding the most effective one can be quite hard. LifeBuddy is the perfect workout app for users that like to save money on gym membership and expensive equipment, following workout routines from the comfort of their homes, achieving their fitness goals easily and quickly. Because of all offered on this app, we pronounced it as our Fitness App of the Month. Read more about it. What is LifeBuddy all about? LifeBuddy is a workout app which is very convenient and effective, easy to use and offers the most versatile goal-based workout program that provides you with workout routines for all your main muscles. Without wasting your money paying for gym memberships or equipment that is expensive, this training program can be done from the comfort of your own home. Developed for Android users, this app will help you to easily, quickly and comfortably lead a healthy and fit life. Just grab a mat and some dumbbells to start the workout program. For all your main muscles, workout routines are provided as well for a calorie tracker that allows you to track the number of calories you are burning with each workout. The app calculates the calories based on your personal info like your gender, weight, height, and age. Achieve your fitness goals at home without going to the gym, in a few minutes a day, using minimal equipment like a set of dumbbells, mat and a chair. Chest and biceps, abs, triceps and shoulders, legs and back workouts are available for you and you will train to do two supersets in a row followed by rest, and move from one set to another without a break. While your one muscle is recovering, you are performing another exercise on a different muscle. Over 190 exercises with video demonstrations are offered and you can choose between beginner, intermediate and advanced level workouts for your body. The mini guide of healthy foods allows you to create a flexible diet plan and you can fine-tune your macros intake depending on your goals. You won’t do the exact same workout in the same exact order because the workouts are auto-shuffled. Track your macros easily and accurately with the macro calculator offered on the app. Download it for free on Google Play now to get provided with workout routines for all your main muscles! Nowadays there are tons of apps that can help you take good care of your pet or even as a pet carer to find easily jobs around you. Petbuds is the most amazing pet service app which offers pet carers a chance to grow their business and offer their pet services and for pet owners to connect with trusted and vetted pet carers to take care of their pets. We liked this app so much, we pronounced it as our Cross-Platform App of the Week. 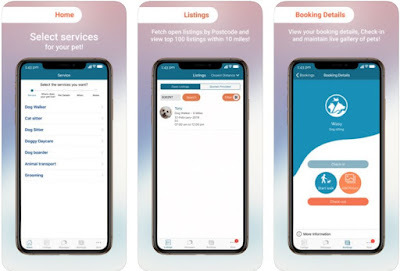 Developed for android and iOS users, this app for pet services is designed especially for both pet carers and pet owners to register and connect with each other, directly on their phones. Pet carers with the help of this app get the chance to grow their business and discover jobs around them. Pet owners using the app’s help are able to discover local vetted and trusted pet carers to take care of needs of their pets when they can’t, always finding the right service where their pet will be in good hands. The Petbuds app offers a GPS service for both pet carers and pet owners to enjoy it. Create a strong profile as a pet carer to grow your business or register as a pet owner to find local vetted and trusted pet carers around you for the needs of your pet. 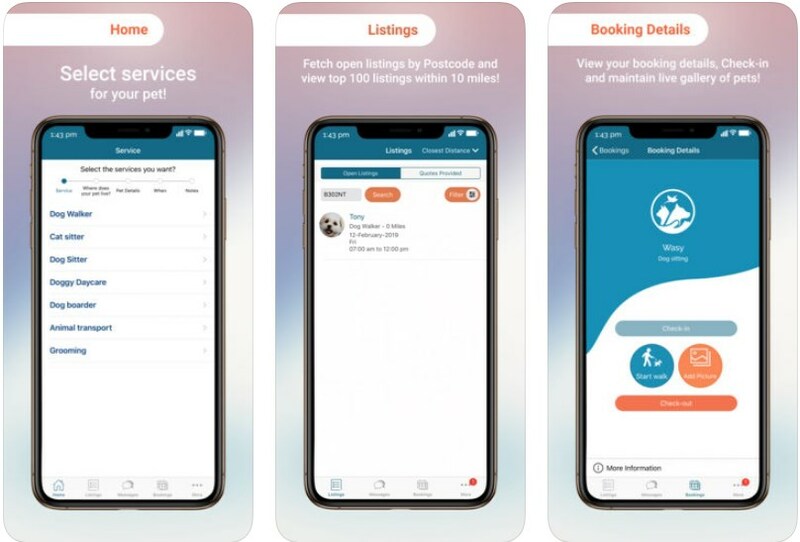 On the app you will be able to discover various services such as dog walking, cat sitting, dog sitting, dog day care, grooming and other services. Pet carers on the app can fetch open listings and view the top 100 listings within 10 miles. Pet owners can view their booking details and check and maintain the live gallery of their pets. Also, pet owners are able to track the walks of their pets with time and distance, track the live picture uploads and even source the right care of their pet to make sure the pet is taken care of well. For the services you choose you can pay directly through the app. Unlimited earning potential is offered for pet carers and they are fully ensured and also they can view ads in their area, use the multi-tracking function and check services in and out. The payments for the pet carer services go directly to his bank account. Download the app on Google Play and App Store for free to grow your pet caring business or find a local pet carer! Sometimes when you work out or you are on a diet, it can be quite hard to determine the time you need to get your results. However, nowadays there are many apps that can help you estimate the time you need to work out or diet in order for the results to be visible. Among so many of these apps, finding the perfect one to calculate the time needed for your abs to show is not that easy. We looked and we have to offer an amazing abs calculator. 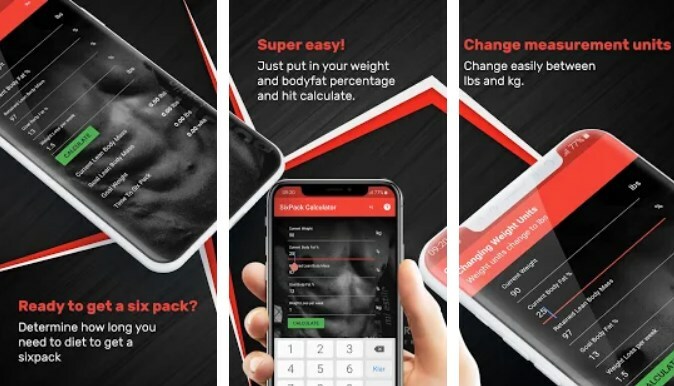 SixPack Calculator is created for Android users, especially designed as an efficient abs calculator which offers you the chance to determine the weeks needed to diet in order for your six pack to show. With the help of this quite easy to use fitness app, users are only needed to enter the body information required and hit calculate in order to find out how much time is needed for their abs to show. Without any effort, the results of the calculation are available instantly on the user’s phone. With the features that offers SixPack Calculator the user gets the ability to easily and quickly determine the weeks he needs to diet so his six pack is visible. In order to calculate the time needed, the user is required to put in the body fat percentage and body weight and hit calculate to find out. The user is also able to change the measurement units as he likes, switching between kg and lbs. To determine the body fat percentage easily, users can use the reference pictures to estimate their body fat percentage correctly. The app will save you a lot of time and effort, instantly calculating the weeks needed in order for your abs to show. All you need to do is to enter the body information required and hit calculate to find out how long before your six pack shows. Download it on Google Play now for free and calculate the time you need for your six pack to become visible! We spend a lot of time on social media sites and there are many games that can boost our social media experience and make it even more entertaining. #DARE is the most incredible social media game that offers you hundreds of social media challenges that you play in, creating dares for others to do something interesting or participating in dares and completing challenges to win money. Because of all that, this is our iOS App of the Month. Developed for iOS users and soon for Android too, this social media challenge game offers users tons of exciting and fun challenges they can be a part of that can bring them money. Users can play this game, create a dare and challenge someone to do something or they can try and complete a dare themselves. Complete a social media challenge and post it online for others to see what he did and he will be paid for it. Make your social media experience even more fun, play the game and make money while playing. #DARE has tons of challenges that make these games endlessly fun and exciting. The challenges involve singing, dancing, or doing something just plain ridiculous like dressing up as members of your family and doing impressions or eating something gross in the closest refrigerator. 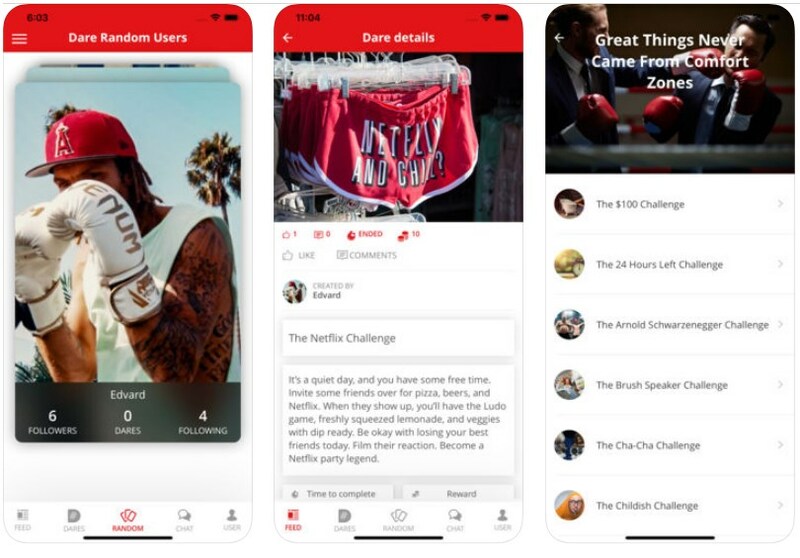 Dares can be created by each user and he can choose the challengers for it as well for the time that the challenge needs to be completed as well. The user is also choosing if his challengers will be private or public. The user himself can be a part and participate in challenges of other users and for each challenge, he completes he will be paid for playing. A reward of Nerd Chips is deposited in the account of the user when he completes a challenge and post is online. 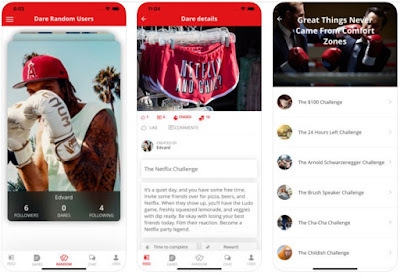 Hundreds of fun and exciting challenges are available on the app and this social game is quite a buzz across social media such as Facebook and Instagram. Download the app now on App Store for free to play, create dares and challenge others to participate! While science-fiction-steeped games tend to fare best on consoles and PC, quite a few sci-fi space games reach the mobile market as well. However, given the shovelware that clutters Google's app stores, it might be hard to figure out what space inspired games are worth your time. Today we will talk about one of the very best ones – Armada Commander. Armada Commander offers amazing playability, gameplay, visuals and optimal challenging moments to keep you engaged and entertained. This means that it ticks almost all boxes of a perfect RTS space battle. You are in the role of a commander of a fleet and its spaceships. Your goal is to liberate the space stations of fallen Omegus Galaxy. And since this galaxy is occupied by 150 alien spaceships and 12 different alien spieces, you are sure to have fun time in completing the missions and destroying the waves of alien attacks. If you love RTS battles, expect pure entertainment. You need to manage, build and upgrade spaceships, and Armada Commander makes it easy for you to understand your purpose and mission with neat tutorials. The control of your POV is at the bottom. After you complete the starting steps and mini tutorial you are ready for battle. In order to dominate your battles, make sure you collect and use the 50+ research modules to upgrade armor, shield and weapons. Another great thing about Armada Commander is the graphics and sound effects. Actually, this is one of the visually most appealing space RTS games we ever reviewed. If the storyline and this review attracted you, good news that Armada Container is a free game. So don’t miss the opportunity to enjoy some exiting rts now for free. We all have busy lives, it comes with the time we live in and while this wonders for productivity, it can be quite difficult to find time or energy to stay in shape. However, there are many personal workout apps to help you stay in shape, get fitter and healthier. To achieve your goals and amazing achievements without wasting money on gym memberships or equipment, we looked and discovered a great workout app offering workout routines to follow. Finding pet services in your local area that are offered by trusted and professional pet carers is not that easy if you don’t have the right app in your hands to help with the search. Tons of this service apps are designed but not many offer all the features you need to take good care of your pet. We did our research and we discovered an amazing app for pet services that allows pet carers to offer their services and pet owners to choose the best service for the needs of their pet. The app is called Petbuds! Earning money or gifts and rewards online is becoming more and more popular among users around the whole world. Because of its popularity, there are lots of reward apps that will not help you to earn some real cash and will only waste your time. Luckily for all of you that like to generate some extra cash or get cool rewards, we searched and we have to offer you an incredible reward app that offers you do the work from the comfort of your home to earn money, rewards, and gifts. Let’s see what the ZeusRewards app is about. What is ZeusRewards all about? This reward app is developed for Android users in need for some extra cash they can earn from the comfort of their office or home, without much effort on their phone or tablet. 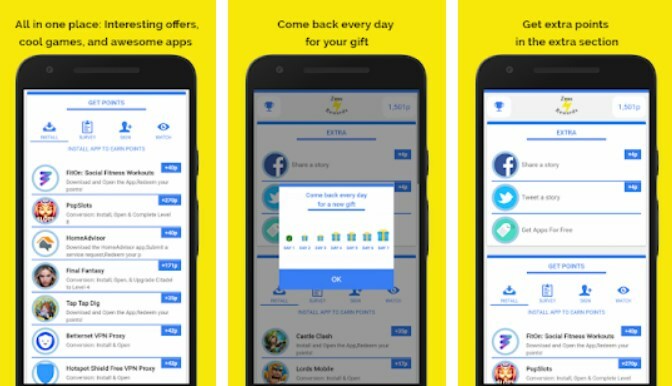 Easy and fun to use, this gift and reward app allows users to do simple things they do every day to earn gifts and rewards. 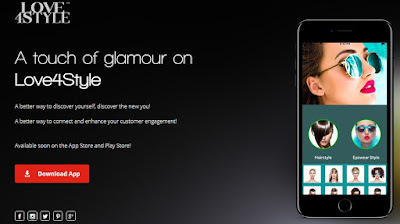 Users can earn points by downloading existing apps, playing games and discovering great offers. By earning and collecting points, the user is able to convert those points to cool rewards and gifts. With ZeusRewards, the users will discover all in one place, all interesting games to play, awesome apps to download and great offers to discover. All that plus earning some extra cash from it! Download apps on Android to discover great offers and earn points. Not only that you can earn by doing the work you need to but also by sharing the app with anyone you like to you can gain some extra points as well. The points you’ve earned on the app can be easily converted to gift cards and rewards. Also, extra points can be earned if you use some apps you’ve downloaded for some time. Directly on your phone, do the work needed from home or anywhere else you like to get that extra cash without much effort. On this app, you can come back every day to get your reward. The points you’ve earned on the app can be converted to cash in PayPal. 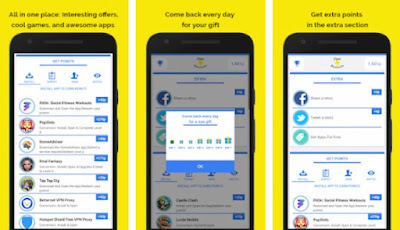 Play games, download apps and find great offers to earn the needed reward points and get the coolest gift cards and awesome rewards. Download it on Google Play for free to play games and download apps to earn rewards and gift cards! Decorating and furnishing our home can be quite confusing if you don’t have the tool you need to visualize the ideas you have before you start the real work. iCanDesign is the most incredible intuitive interior design app which allows you to visualize your interior design ideas in 3D, inspiring you how to enrich your home and allowing you to share the vision you have with others. We liked this app so much, we decided to be our Most Useful App of the Week. 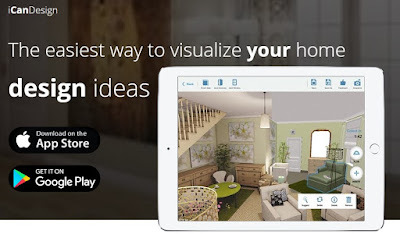 Developed for Android and iOS users that like to decorate their homes and furnish their houses or apartments, this intuitive home design planner offers you the chance to easily and effortlessly visualize your interior design ideas, changing anything in the picture you like and sharing your vision with others as well. The room planner offers you predesigned layouts for rooms like your bedroom, bathroom, living room and more to inspire you. Enrich your habitation with the furniture from world famous brands and get a better idea of what your home with look like. As a user, you can choose to start the design from an empty room or from one of the existing handcrafted projects made by the industry professionals. Furniture and decoration can be changed and also you can add new items from IKEA or other brands, observing the room from different points and creating photorealistic snapshots. For rooms like bedrooms, kitchens, home offices, living rooms, baby rooms, kids’ rooms and other rooms the app offers many design themes to choose from. The app is offering you additional features like ready-made designs, full furniture catalogue with 5000 products, 3ds Max export, unlimited number of rooms and photorealistic HD renders through an auto-renewable subscription for a week, month or year on the app. Download the app on Google Play and App Store for free to decorate and furnish your home to enrich your habitation! 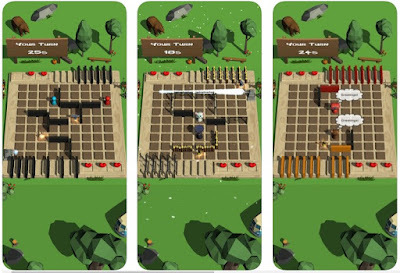 If you like playing simple and yet challenging endless tap games on your smartphone then you know it’s difficult to find a fun and yet thrilling game to put your skills on the test. Flappy Dunk Ball is the perfect game for you to showcase your tapper skills, focus and precision to see how long can you last in the quest and achieve the highest scores. Because we liked this game so much, we decided to be our Endless Tap Game of the Week. What is Flappy Dunk Ball all about? The Flappy Dunk Ball will require from the tapper to showcase his immense focus, precision and concentration in order to match the colors correctly and score. Developed for android users, the flappy hoop game is easy to play and yet challenging, leading the player on a journey of thrilling precise ball tap challenges and endless ball ring matching. Easy to play and addictive, you need to stay in the game as long as possible to win your scores. Start the quest to see how far you can go in this flappy game. Featuring vertical flappy hooks with different colors, this flappy hook game requires players to go through the flappy rings of the same color while the bouncing flappy ball is changing its color constantly. The thing that makes this game super-challenging is the position of the color matching ball rings and the flappy ball that varies. Follow where the flappy ball and circles are taking you to showcase your reflexes, precision and concentration. You will lose the game if you miss the correct ring toss and fail to go through the flappy circles. Expertise the perfect ball bounce and tap fast in order to achieve the highest scores and experience the thrilling flappy hoop dunks. The ultimate goal of the player is to tap jump and bounce with the ball as long as he can. The game will easy in the beginning of the game but as the player gets further it will become more and more challenging. Put your skills on the test to see how long you will last. Download it for free on Google Play to test your skills on the journey of endless ball ring matching and ball tap challenges! After so much time spent on social media sites, the everyday experience can become quite boring if you don’t find new ways to make it interesting again. One of the most exciting and fun ways to keep yourself entertained while scrolling down your social media accounts is by playing and participating in challenges, completing the dares and sharing with your friends. We did our research and found the most amazing social media game you need to try. Developed for iOS users and soon for Android too, this social media game offers users tons of exciting and fun challenges they can be a part of that can bring them money. Users can play this game, create a dare and challenge someone to do something or they can try and complete a dare themselves. Complete a social media challenge and post it online for others to see what he did and he will be paid for it. Make your social media experience even more fun, play the game and make money while playing. With the development of smartphones and apps, nowadays is quite easy to try and discover the latest fashion trends without searching through stores. When it comes to trying out a new style, now you can directly on your phone with the right try-on tool. This type of tool allows to try different cool hairstyles and eyewear and discover the perfect style for you. We did our research and found the most amazing app for these purposes. 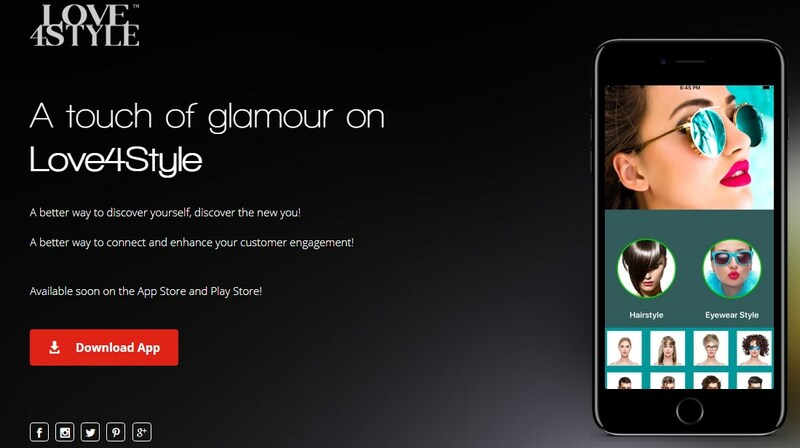 Discover yourself via new looks with this incredible entertainment app called Love4style. It is designed as a virtual try-on tool that is easy to use and fun, offering you the chance to try new looks with sultry sunglasses, cool glasses, and interesting hairstyles. With this app developed for iOS users, you are offered a collection of the latest trends on hairstyle and eyewear looks. Love4style is an incredible virtual try-on tool with instant sharing capability that offers a collection of the latest trends of eyewear and hairstyles to try as your new look. Try hairstyles for women and men, hair coloring, eyeglasses for women and men, eyeglasses and sunglasses with flexible filters can be discovered on the app and the app is also including a user guide. There is an extensive offering of eyewear within the app like sunglasses, glasses, eyeglasses. So no matter if you need sunglasses for the summer season, or eye wear like eyeglasses for your day to day wear, you can really find some great eyewear designs. The looks you try can be shared on Facebook or Twitter and you can also have fun with the amazing flexible styling tools to unlock and edit styles. The multiple filters allow users to separate or create different combinations with a fun and friendly interaction like styling using your fingers as an alternative option. The favorite looks of the user can be saved, reviewed and adjusted. To be familiar with the app’s functionalities you are offered the availability of models. A business that use this app get the chance to connect with customers, enhance their customer engagement and build their brand awareness. This means that eyewear brands or sellers, hair accessories brands and hair saloons can sue Love4Style to showcase their products and benefit directly from the amazing platform and technology behind Love4Style. They can enhance their customer engagement and show their products to customers. Download the app on the App Store for free to try cool hairstyle and eyewear styles and share your looks! For lovers of fun and yet challenging puzzle games that will push you think hard and fast to solve each puzzle it can be quite hard choosing the best puzzle of them all. Jewel Blitz is an incredibly exciting, fun and addictive block puzzle game that will put on test your skills while you try to fill the rows and clear them before your run out of time. Because of all this that the game offers, we pronounced it our Puzzle Game of the Month. Developed for Android and iOS users, this jewel block puzzle game will put on test the player’s puzzling skills as he tries to clear the rows before he runs out of time. Easy to learn, with amazing graphics and sounds, the game gest players hooked to playing fast and they can choose to play for fun or to play for real cash prizes. 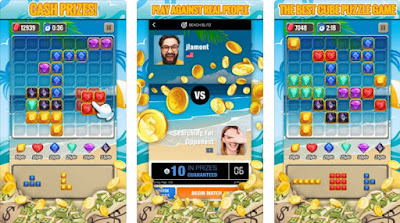 Players can enter game’s tournaments and head-to-head competitions with real cash prizes, facing off players of similar skills, competing and trying to win the highest scores. How to play Jewel Blitz? The Jewel Blitz requires the players to clear the lines to score in the game to place higher of value cubes last to complete the rows for bonus points. To beat the opponent the player has only 3 minutes to arrange the shapes onto the board and try to clear the rows without running out of the room. Drag blocks to the board and fills the rows to clear them out. The players get the choice to play in head-to-head competitions with other players or to play in large multiplayer tournaments. Both players in head-to-head games get the same order of the same blocks and first of them who finishes gets the highest scores and win. Rank on leader-boards and get trophies for your achievements and challenge players from the world to puzzle against you. Show your skills in the cash tournaments that are available in about 75% of the world and if you don’t live in those regions you can play for fun, with the virtual currency of the game. Download the game on Google Play and App Store for free to arrange shapes, face off players and win real prizes! Are you an Instagram user? Or do you want to view profiles, download Instagram profile photos, videos and stories? 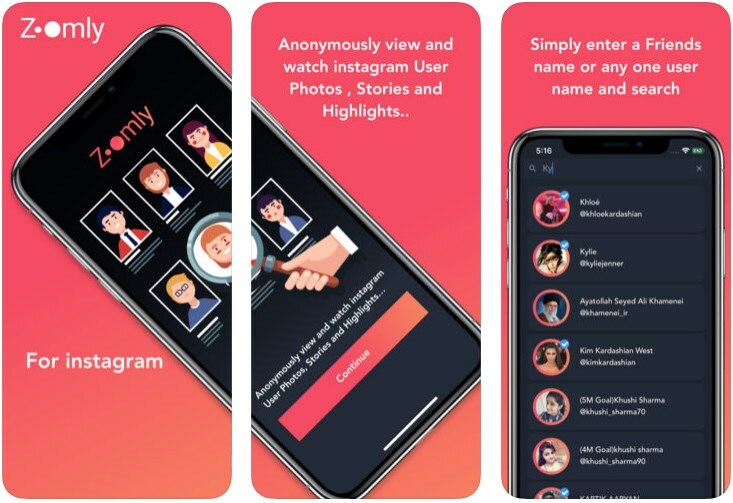 Well, you will be interested in the app we will present today – Zoomly. What is Zoomly for Instagram? Zoomly for Instagram is an Android & iOS app for that gives users the opportunity to download profile pictures, videos & stories without having an Instagram account. Users can anonymously view and download content from Instagram profiles without signing up. Download the app and in the top search bar enter the user name you want to view. The app suggests user names so you will be able to easily locate the desired username. Once done, you can easily view the profile photo, stories & highlights. There is a big download button which will save the content to your phone. That’s it. Zoomly is practical, fast and easy to use – and that’s why we loved it. It is indeed a useful tool for Instagram users who are using the app daily and expanding their network of followers. The app is completely free, which is also a plus considering that many apps are charging fees for the same features that Zoomly provides for free. Get it now for free on the App Store or Google Play. Board games have been around for a long time. However, with the development of smartphones, now you can find this type of games available to play on your phone. Tons of different board games are offered to you which makes it difficult to choose the most interesting one. If you like to test yourself and strategize to outsmart your opponent, we did our research and found an amazing board strategy game that you need to try it out, called Labyrintheon. Created for Android and iOS users, Labyrintheon is incredibly exciting to play and yet highly challenging board strategy game that will push you to the limits to think smart and create the best strategy to reach the other side of the board before your opponent does. With its sharp graphics and amazing sound effects, the game will keep your attention each time you play. Be careful and think fast in order to outsmart the opponent and stop him from reaching the other side of the board before you. Labyrintheon provides players unique gameplay and a variety of features that will get them addicted to playing fast. Putting the player’s skills on the test, the player needs to think smart and chooses his moves carefully. Move for 1 field and wait for your turn. Players can move and jump over their opponent if they are next to him or even choose to get him running through a labyrinth by building a wall. The ultimate task is to outsmart the opponent and reach the other side of the board first or destroy him. Power-ups such as shock waves, field switchers, wall punches and speed boosts are offered along the way to help you outsmart the opponent. The player has the chance to compete for solo against a computer, choosing his difficulty modes like easy, medium and hard corridor board strategy battle or he can choose to battle against other players or compete against his friends in the local board game multiplayer mode. For any game mode, at any time, the player can check his win and losses stats. 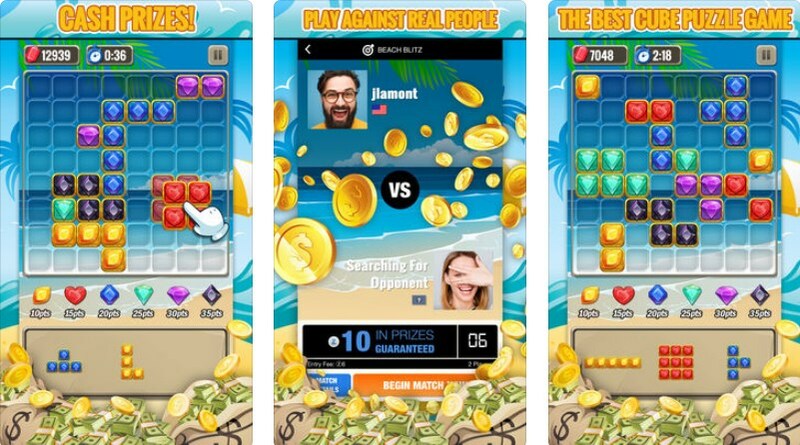 Download the game for free now on Google Play and App Store to strategize and outsmart your opponent! Scanning apps can be quite practical in our daily lives, helping us to keep track of our balance and stay organized. 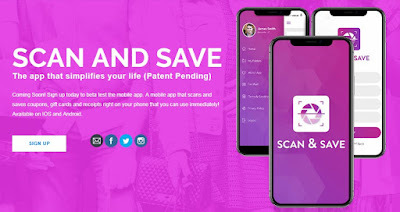 Scan and Save App is an amazing scanning app that will simplify your life, saving your time and money by allowing you to scan and save barcodes of your receipts, gift card and receipts, right in your phone, accessing them easily whenever you want. We pronounced this app as our Cross-Platform App of the Month. Read more about it. What is Scan and Save App? Developed for Android and iOS users, this barcode scanning app is beta tested with high quality, easy to use and very practical, offering you powerful barcode scanning capability to scan and save barcodes of coupons, receipts, and gift cards right on your phone, immediately whenever you want to use them. With the help of this scanner app, you will be able to save your time and money accessing barcodes you need, right at the moment, organizing them and managing them as you like. What are the app’s best features? The Scan and Save App with its features offered will make it easier for users to scan barcodes of their coupons, gift cards, and receipts so they can manage and organize them in folders to access them easily when they need to use them. Stop wasting time looking for your receipts or grabbing gift cards and coupons from envelopes with the app’s new technology and smart notifications offered. Just with your phone’s camera scans the barcodes and organize them as you like in folders of your choice so you can easily access them. Sign up to scan, save and customize your captures by choice, creating folders to separate your gift cards, coupons and receipts. For the captured receipt or scanned barcodes, you need to complete the information needed. Save the names of the stores you’ve captured barcodes from so you can keep yourself organized. Keep track of your balance, saving time and money with each use of your barcodes, accessing them easily right in your phone. Sign up for beta testing on the app’s official website now for free – it will soon be released on the App Store/Google Play to scan and organize your barcodes! How to get job ready and enter the job market with real job experience? Nowadays you can do this easily just with the help of the right app on your smartphone. Learning digital marketing is possible by taking online marketing courses while getting matched with your ideal business. To help you gain the experience you need and get the right certifications, we did our research and found an app with free digital marketing courses, apprenticeships, and certifications. Let’s discuss it. Developed for Android and IOS users as well, this is a highly efficient learning app for users that like to take free marketing courses, digital apprenticeships, and certifications in order to get job ready and enter the job market with real job experience. This user-friendly platform is easy to use and it offers digital marketing courses, including courses in content marketing, SEO, email marketing, paid ads, social media and more. These fast and fun micro courses are available on your phone, for free. What are the best features of GenM? GenM offers you free marketing course and digital marketing apprenticeships so you learn digital marketing and get ready for a job. Join 10,000 other students who are jumpstarting their careers. You are offered to get one on one mentoring from a top 12% experienced business owner in a 3-month digital apprenticeship, apprenticing with vetted businesses. Each apprenticeship offered is remote and flexible, only 3 months, 5-10 hours a week, without any long term commitments so you are completely enabled to go to school or to work full time. Choose the business you want to work with by finding your ideal match, choosing from 100+ daily matches. To filter the perfect match, search the app’s filters and even easily message businesses and chat with them. Put on your resume a real-world experience by getting the only pro certification. Gain the work experience and references you need to successfully enter the job market with 24/7 client support from the app’s client success team before, during and after your apprenticeship. Download the app for free on Google Play and App Store to find the ideal match and get certified in digital marketing! Mental health apps offer a wealth of resources that make therapeutic techniques more accessible, portable, and cost-effective. Within minutes, you can find and download a myriad of apps that can help you improve your mental state. However, if you need help in a situation you are facing in your life, there are online counseling therapy apps to help get through your problems. We did our research and found the best mental health app for these purposes. Let’s discuss it. Developed for android users, Tell A Buddy is a unique and highly efficient online counseling and online therapy app that is quite simple with a user-friendly interface offering users in their moments of psychological despair to get professional help by certified professionals from various fields in an easy convenient manner. Improve your well-being with the help of psychologists that will walk the journey with you, and all that with complete anonymity and discreetly, regarding the feelings and information you share on the app. Talk to someone online to change your life to better. What are its best features? Tell A Buddy with its features and quality professional online therapy and online counseling will offer the best way for you to get through any problem or situation you are facing in your life. Discover motivation to continue forward and get pass through anything, finding easily what works best for you. Useful for all fields of life and all age groups, this app can help you solve problems in school, problems with friends, relationship problems, family problems and other. To start the therapy process, pick a private chat with an online therapist for online mental health counseling. For users that just seek advice or opinion, the app offers the feature of group chat. Each user has an unlimited number of sessions. Users will never feel along using this life management app and online counseling tool that offers them tons of ways to get through anything in their life, easily changing and improving their overall well-being. Download the app on Google Play for free now to get professional help and improve your overall well-being! From digital mood boarding to virtual consultation, there are a variety of interior design apps that can inspire. They source. They even color swatch, walk you through home renovations and allow you to preview objects in 3D augmented reality. To enrich your habitation, decorate it and furnish it, there are home design planners that can make it easier for you to visualize your ideas. We did our research and we discovered an incredible interior design planner. The app that we’re talking about is called iCanDesign. Tons of medical apps for many different purposes are developed which makes it hard to find the best medical app for the healthcare industry to connect and engage. MediFellows is an innovative digital platform designed for the healthcare industry to interact with each other, connect and discover many opportunities within the community. Because of all that the app offers we decided to be our Medical App of the Week. Read more about it in the review below. 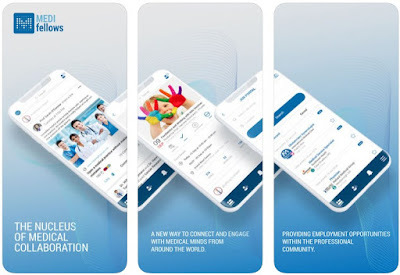 Developed for Android and iOS users, MediFellows is an innovative digital platform designed by the healthcare industry for the healthcare industry offers a range of easy to use features to help the medical community interact within the industry with credible content. With its simple clean user-friendly interface, the app allows the industry to connect just with a tap on their phone. 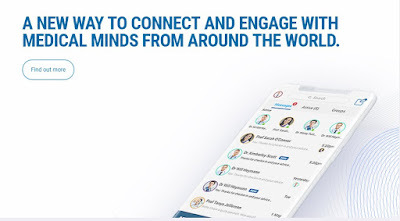 The healthcare industry within this platform gets the chance to connect and engage with medical minds from all over the world, searching and discovering many employment opportunities within the professional community. The MediFellows offers users from the healthcare industry to create their professional profile with their background, experienc, and credentials and to post their own content within their profile, following posts of other users, commenting, liking, sharing and tagging posts too. Private and public groups can be created by users with other fellows of their choice on the app. Business profiles can be created as well by users so they can showcase their product, service and medical business. 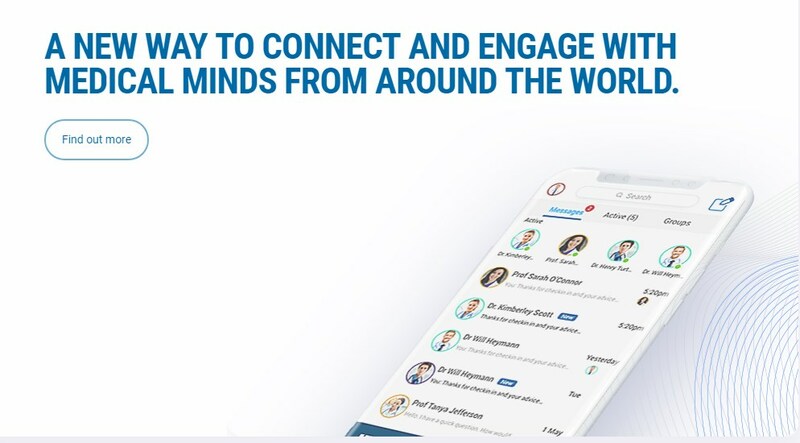 The chat and group chat function of the app allows users to connect and collaborate with like-minded medical professions from all around the world. The healthcare users get the chance to collaborate in an integrated, user-friendly manner on a platform where the content and interactions for healthcare professionals driven by healthcare professionals. More features will be added on the platform such as creating events, job portal and marketplace for selling and buying items within the medical community. Download the app on Google Play and App Store to interact and collaborate within the healthcare industry! The mindfulness practice is undoubtedly good for you - meditation can help reduce stress, chronic pain, and blood pressure, as well as help you quit smoking and better navigate a variety of mental health conditions. So, how do you finally buckle down and do it? Apps. Meditation apps can help you practice anytime, anywhere, putting the power of mindfulness in the palm of your hand. We did our research and we have one of the most incredible meditation apps to offer to you – meet Mindbliss! Developed for both Android and iOS users, Mindbliss is a meditation and mindfulness with simple guided meditation and breathing exercises. Its meditation tools are designed by the best teachers who are helping users to become happier, gain valuable insight and cultivate a powerful daily personal practice. With this app you get the chance to meditate and rediscover your calm with world-renowned teachers, boosting your self-confidence, improving the sleep and learning to overcome your anxiety, grief or stress. Choose a session to relax or choose a journey to take your practice even deeper. The Mindbliss app has 7 different categories that allow users to choose their favorite tools in order to discover the meditation sessions and journeys that fit their needs the best. From the best teachers, there are designed hundreds of meditations and curated sessions to help you get better sleep and reduce anxiety. Listen to sessions of choice offline by saving them and easily track your progress. Discover journeys and sessions with the help of the highly intelligent algorithm available. The iOS version of the app also uses Apple Healthkit to track the mindful minutes. Build better self-esteem, self-confidence, and perspective with the guided meditation exercises, reducing the anxiety and stress with calming meditations. Deep positive transformation is possible with the binaural beats mediation and synchronization of the body with sophisticated breathing exercises. Relax with the vast library of relaxation music, restore your mind and spirit with 3D nature soundscapes, building happier you and improving yourself with the app’s positive affirmations. Try the hypnotherapy to gain control over subconscious fears and self-esteem. Access to 15 sessions, 3 journeys, and daily meditation sessions are offered for free and for more, you need to subscribe monthly or yearly on the app. Download the app for free on Google Play and App Store to rediscover your calm with meditation and breathing exercises!